There are a few possibilities but the most probable involves your floor mats. Most rubber backed mats have antioxidants added to the compound. Over time and exposure to UV and Ozone, rubber products can break down (dry rot). The problem lies in that these types of chemicals are migratory and tend to leach into adjacent products such as vinyl. Once they migrate, they are sometimes impossible to remove. 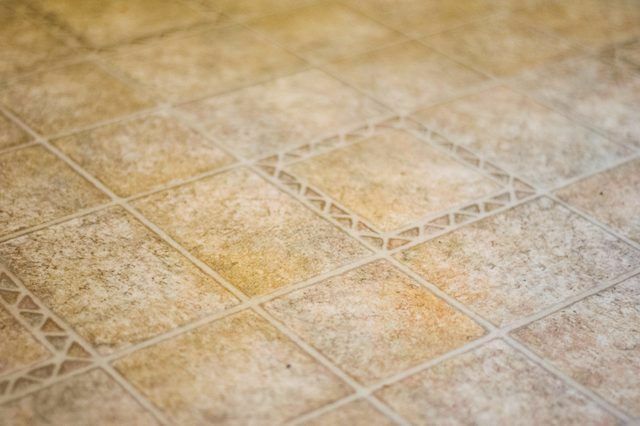 This problem can also happen in vinyl garage floors. Car tires often leave a similar stain, because its made of the same kind of products. How to get them off? Unfortunately we have not found another solution. So really the best question to ask is: How to prevent the damage? Regularly service your floors with floor finish (wax). This is not a one-time process but instead a regularly scheduled cleaning and re-coating service that we Buzz Brite specializes in. Very helpful DYI videos are available online if you wish to do the work yourself. If this fails, we are at your service.